The Epson MovieMate 85HD is the latest in the company's line of value priced home entertainment projectors. Listed at $899 with a native 1280 x 800 resolution, the 85HD displays 720p widescreen movies without compression, and it handles all sorts of other sources including audio discs, game consoles, USB memory sticks, computers, and HDMI devices such as Blu-Ray players. 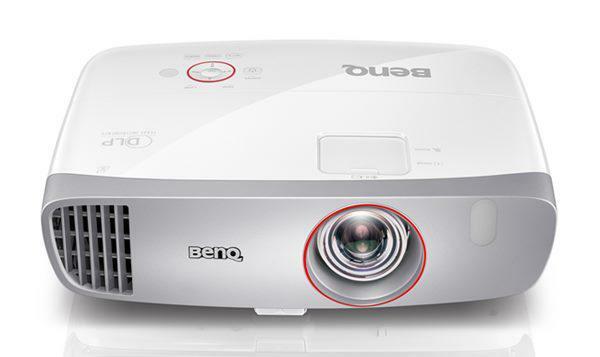 This is no lightweight projector at 9.3 pounds, but when you consider that it houses a DVD player, a 20-watt audio system, and a 2,500-lumen projector in one integrated package, it really is quite compact. Maybe the nicest benefit of all this integration is the absence of cables that usually connect those individual components. On the 85HD there is nothing to contend with but the power cord. While not home theater quality, the 85HD does put up some nice video, and the audio impact is far better than most projectors its size. It is designed as an entertainment center, and whether you want to sing a bit of karaoke (there is a microphone jack), watch a movie, or look at your photo CD of Uncle Ralph's last mountain climbing adventure, the 85HD makes it easy to gather family and friends and get things cooking in short order. It can also serve as a music playback system when the video projector is not in use. When the weather is nice, the backyard can become an impromptu outdoor movie theater. Throw a few blankets on the grass, tack a sheet to the side of the garage for a screen, and watch your favorite movie with friends and neighbors. The 85HD is a great addition to Epson's line, and it brings new versatility and performance to the all-in-one class of entertainment projectors. Brightness: Three of the four preset modes (Dynamic, Game, and Living Room) all put up 2,580 ANSI lumens . . . plenty of light for all but the brightest rooms. Theater mode reduced brightness to 1,335 lumens which is more appropriate for movie viewing and color balance was improved. The Eco lamp setting lowers brightness by 30% in all modes and extends rated lamp life by 1,000 hours. Uniformity: The 85HD's brightness uniformity of 87% is a little above average for this class of projector. There is a gradual increase in brightness from the top toward the bottom of the image, and there are no distracting hot spots. Can the Epson MovieMate 85HD be ceiling mounted? Does the menu have an option to "flip" the video image if the projector is mounted upside down? I've looked at the Epson website and studied the PDFs manuals and brochures and can't seem to see any photos that show the bottom of the projector...wondering if there are 3 screw holes that will allow the projector to be mounted from the ceiling? This would actually be a high-volume item if it had a Blu-ray player instead of just a regular DVD player. There are no screw holes or mounting apparatus on the bottom side of the projector, I just bought one. In order to project from the ceiling, I'm making an adjustable bracket to mount on the ceiling joists. I asked the help desk prior to purchase, there is no capability to "flip" the image, only a +/- 30 degree horizontal image adjustment. Is there any difference between the 85HD and the Powerlite Presenter? Specs look identical and looks like the same just branding to different consumers. Local store sells both at the same price, but occasionally puts the Presenter on sale at $100 less. Main use will be for home and outdoor movies. Any comments would be appreciated. It is able to be flipped..just look through the menu..mess with all the buttons..u will find it. That's what we did. Just can't remember which button. we own a movie mate 70 the predecessor, this is the newer model of it. The 70 model has all the same features. We have had the 70 model for 4 years and we love it. Should this one ever break I will buy the newer 85 model. We our own bulb 3 now at about 140.00 each We use our projector 20 hours a day it hooked up to our derict tv service our bed room wall is 9 feet high and 20 feet wide, the max with of the picture is 18 feet wide and 9 feet high, u can reduce the picture down to about 4 feet high and 6 feet wide. You dont need a projector screen go to you paint store and order a color called silver screen, paint the wall you want to use and you are in business. Slick wall is better. The blub gets weaker after about 5000 hours we get about 10 ,000 hour out of the bulb before u have to replace it our about a year and a half of service. Take into our bedroom is painted dark, flat dark blue, incl ceiling, and back wall is painted all silver screen coler. 20.00 a gallon home depot our lowes its in their color codes, you have to tell them to look for it, it's not a normal seller. our is hooks to a laptop, playstaition 3, drectv, ipod, trendnet [plays internet tv] all switched tru a hdemi switch box it awasone and we love it. Every one who see's it in action is blown away. I bought one of the Movie Mate 85hd, and this has been the best investment I've ever bought. Yes the screen can flip in the Menu options. I did I before.... I was trying to mount it but there is no option that it came with that would allow it... So AMA have to just make a adjustable bracket hanging from the ceiling. This projector can connect to literally anything. Even from my iPhone, computer, USB flash drive, HBMI from my cable Box, DVD .... Wow... I even used an inverter in my mini van to operate with a portable screen. Yes, it does have "ceiling projection". When mounted to the ceiling bracket, the unit is upside-down. Unfortunately, it is not designed to mount upside down to a ceiling bracket, since it does not have any mounting holes to attach it. You would have to wrap it in straps or modify the 3 feet on the bottom. "Ceiling Projection" flips the image so that it looks right side up even though the projector is hanging upside-down from the ceiling. Unfortunately, when "ceiling projection" is selected, words are projected backwards. This would be fine for rear projection, but not when hung from the ceiling and projected onto a wall in front of you. I could not find a setting to correct the backwards image after selecting "ceiling projection". To select the "ceiling projection"mode, turn the unit ON, use either the remote control or the buttons on top of the unit, press the VISUAL SETUP button, highlight SIGNAL with the up/down arrow keys, press ENTER, use the up / down arrow keys to find CEILING PROJECTION, use the left / right arrow keys to highlight ON or OFF, press ENTER. The image will be flipped upside down and will read backwards, which is fine if you're set up for REAR SCREEN PROJECTION, but probably not why you bought this table-top unit.